You can now request ad-free videos from TV saving you valuable time. ClickView’s Curation Team will remove the advertisements from the programme for you so that you don’t have to spend the time searching the video yourself. You will receive the edited program in your Workspace. If a programme has already been edited by our Curation Team, you will notice a red 'ad-free' tag on its thumbnail. 1. Click on the 'TV' tab in the main menu at the top of the page. 2. Search for a programme to see if the ad-free version is already available. You can search based on popularity, channel, program name or even subtitle text. Select the video, press 'Add' button then 'Add ad-free copy'. 3. 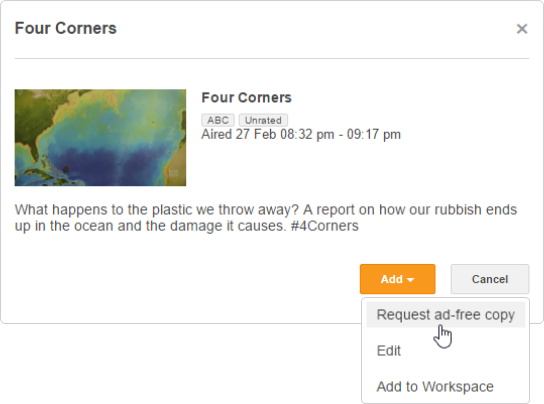 If a programme has no ad-free version available, navigate to the ‘Add’ button and click ‘Request ad-free copy'. The ClickView Curation Team will edit the ads out for you and you will receive a notification once it has been completed. Please allow up to 72 hours for your request to be completed.